With dairy and egg allergies, it can be hard to come up with great breakfast options, particularly ones that remind you of omelets or egg bakes. After a few years with only pancakes as our special breakfast food, I finally realized what would make all the difference in replacing egg in a breakfast casserole: butternut squash. Trust me, you're gonna love it. 1Set aside two casserole dishes, two baking sheets (with parchment paper), and a large mixing bowl. Preheat oven to 400. 2In a large pot on the stove, cook ground turkey at a medium heat until gray/brown. Stir in seasonings (salt, pepper, garlic powder, red pepper flakes, cayenne, onion powder). Chop onion and stir into ground meat until translucent. Empty pot into large bowl. 3While meat is cooking above, peel the squash, scoop out the seeds, and dice squash meat into one inch cubes. Place on one of the baking sheets, toss some oil over them, and sprinkle salt and pepper. Put in the oven for 40 minutes. 4Slice and dice bell peppers and other vegetable of your choice (broccoli, asparagus, or cauliflower) in one inch pieces, place onto the other baking sheet, toss with oil, and sprinkle with salt and pepper (and a little cayenne if you like heat). Put in the same oven as the other baking pan cook for 10 minutes. Keep an eye on it so they don't burn. 5Remove the bell peppers and veggies from the oven (leave the squash in), pour them into the large bowl with the turkey, remove parchment paper, and pour the tater tots on. Put back in the oven for 20 minutes (or the recommended cook time on the tater tot package- doesn't have to be exact because the casserole cooks for longer). 6When the squash and tater tots are done, remove from the oven and reduce oven heat to 350. If the tater tots are larger than one inch (ours are), use a kitchen shears to cut them in half or thirds and pour it all into the extra large mixing bowl. Stir everything in the bowl and add more oil if necessary. Add salt, pepper, garlic powder, onion powder, red pepper flakes, oregano, and nutritional yeast. 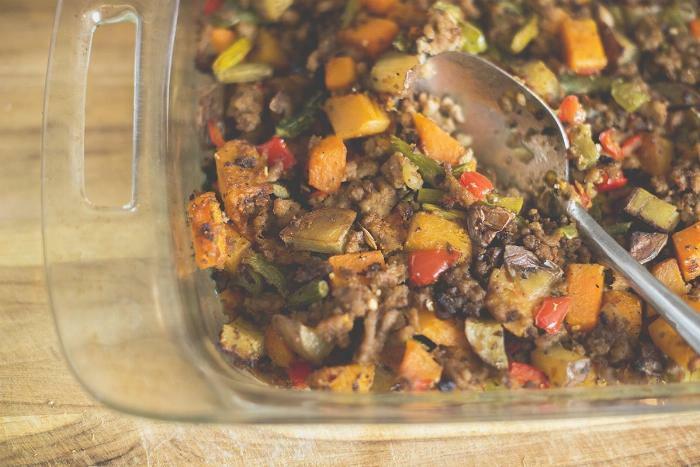 Pour into casserole dishes and put in the oven for 20-30 minutes. Allow to cool and serve. I cook for a family of five, but they eat a TON. If you do not want two full casserole dishes, cut this recipe in half :).